The thing that it doesn't understand which door is open when the door well-set is not made though there is a marketed commodity of the crime prevention bell device. The key to the bell release is necessary, and, after all, the case of releasing it is an increasing win in the door or the crime prevention device in the back door to go in and out while setting it. Because the function of a crime prevention buzzer on the market was few for the price, I decided to make this. It is personally produced and use it freely, please when doing. Door well-set check button SW4 is pushed. Door opening display D11-D21 lights if the door well-set is not made. (If the door opening is about five places or less, it lights. I do not think that I see lighting LED any more. ) 12V buzzer rumbles, too. D5 green lights and the buzzer doesn't ring if the door well-set is made. The lamp lights during the fixed time (It is possible to change for about 1-2 minutes) when the lighting switch is temporarily pushed, and 100V buzzer of SW201 rings when going out after it sets it. Meanwhile, it goes out. Of course, start be being another the key. The lamp lights as well as the time that goes out when concealment switch SW202 on the outside is pushed and the buzzer rings when entering. Meanwhile, it enters. If the crime prevention device is setting LED of D121 as seeing from the outside, it lights. Warning stops when the door or the window is closed after it continues, and warning continues for five minutes (It is possible to change) as long as the door or the window is open, and the crime prevention device is set again automatically. It rings again even if it is thought, "It has and it occupies and, this time, enter" because the bell doesn't stop even if the thief tries to enter, the bell rings, and the window is closed, and the bell will stop in five minutes. The crime prevention device is put up besides this device. The content is secret. After the machine the first about 1985 year is produced, the improvement is used repeatedly. There are completely neither a breakdown nor a malfunction. There are results that repulse the thief. Those who set it up about the crime prevention buzzer must do this management by own responsibility. Even if the theft accident happens, I am not concerned at all. This device uses the self-maintenance function of the relay. It has not returned to the origin any longer when the circuit of the relay self-maintained is cut. The bell rings even if the line is cut somewhere. It can be said that neither the breakdown nor the malfunction will happen easily because the circuit is simple. It had a hard time though it thought about this. Though it is an easy circuit if the circuit can be done once. I do not think that I am anywhere maybe. I think that I can use the AC adaptor for 12V of about 200mA-500mA etc. though the power supply used the stabilizing supply of 14.5V. LED of D4 is a pilot lamp of AC100V. D1 is for the prevention of backflow when blacking out. 680Ω of R2 is for the charge always. Please change with the power supply and the battery. SW2 is for the rushing charge. In the power supply for the power failure, the battery for the car of 12V is OK.
9V relay is the one having been used it for VTR of National. It is a product number named VSY2032. 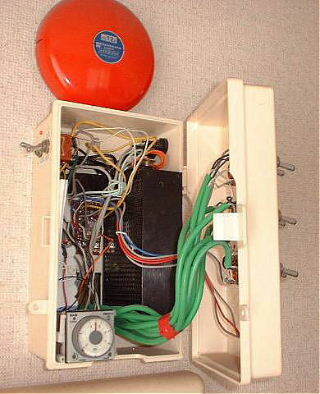 Anything should be able to be used if neither the voltage nor resistance are quite different. Please change 39Ω of R3 according to the relay and the power-supply voltage. For relay current adjustment. To invalidate only a specific door or window, SW11-SW21 is turned on. SW111-SW121 is installed in each door or the window by turning off type crime prevention SW. This wiring is the most serious. When building it, it put it beforehand for me. D11-D21 is for the display of the door or the window where the door well-set is not made. Please install D121 in the position seen from the outside of the place that goes in and out after setting the crime prevention buzzer. SW201 is a lighting temporarily switch to release it temporarily when going in and out putting it internally in the place that goes in and out similarly. This must put SW202 on the outside place not seen easily with the switch for the increase. Though you may see only because the lamp lights and the buzzer rings when pushing. These 100V buzzers can adjust the volume. As for this lamp of 100V, one using the door light and the back door light of existing might be refreshing. To operate well with an easy circuit, it designed. I think that I cannot do any further simply. Please teach if it is possible. 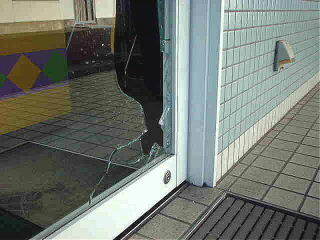 It is a store that the glass of the door at the entrance was broken and the sneak thief invaded. Let's install the crime prevention buzzer so as not to become such a thing. Right in the box and blacking it are the stabilizing supplies. 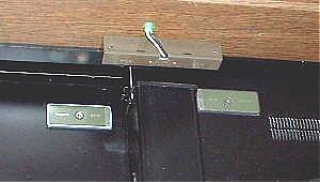 The bunch of a green line is wiring from the turning off type crime prevention switch from each door or the window. It is the most serious to arrange this wiring in the clan. Everything was put for me at the time of building. It was possible to wire cheaply. The one to do equal operation by being use PIC later was made about this multi cooking stove timer. Another page is made and refer, please. In the surface of the box, there is a switch group to which only two switches that set the crime prevention buzzer and specific rooms temporarily release the crime prevention buzzer. There is a switch that switches the power switch to the charge next to the box. It is turning off type crime prevention SW for the door (left) and for the two-leaved door (right). This crime prevention switch works well even if the magnet and the main body are considerably away by the high sensitivity type.